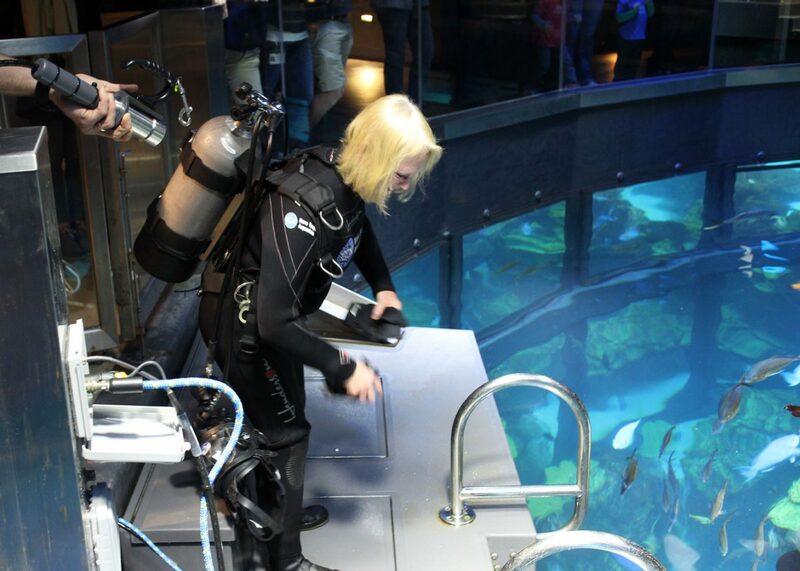 Before she could climb the ladder and exit the Giant Ocean Tank (GOT) after her final dive, she had to dip one more time underwater. She wanted to soak in the emotional moment. 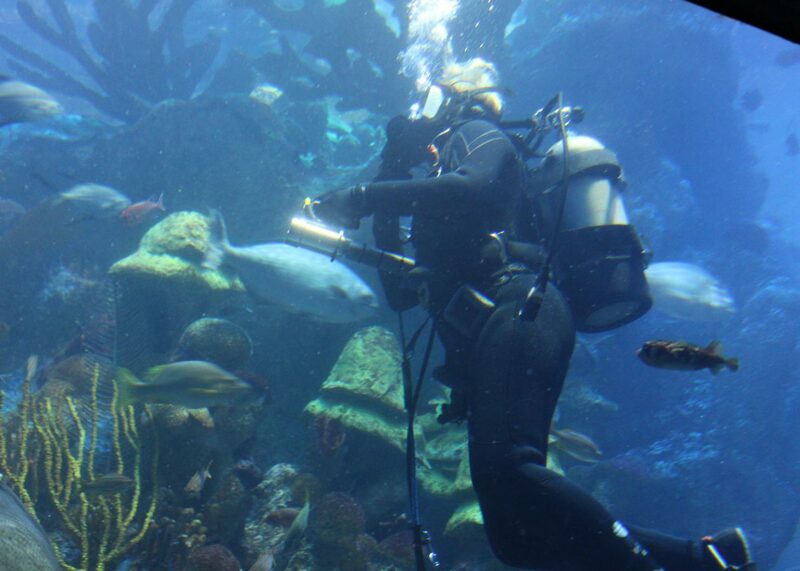 Retiring Aquarium diver Sherrie Floyd made the last of her 5,000-plus dives during a regularly scheduled diver’s talk on a cold December afternoon before an audience of visitors and a large collection of her fellow Aquarium staffers. “Thank you, everybody. It means a lot,” Sherrie said with a quick wave before sinking back into the relative privacy offered by the glass-encased 200,000 gallons of clear water that have been part of her workspace since 1994. 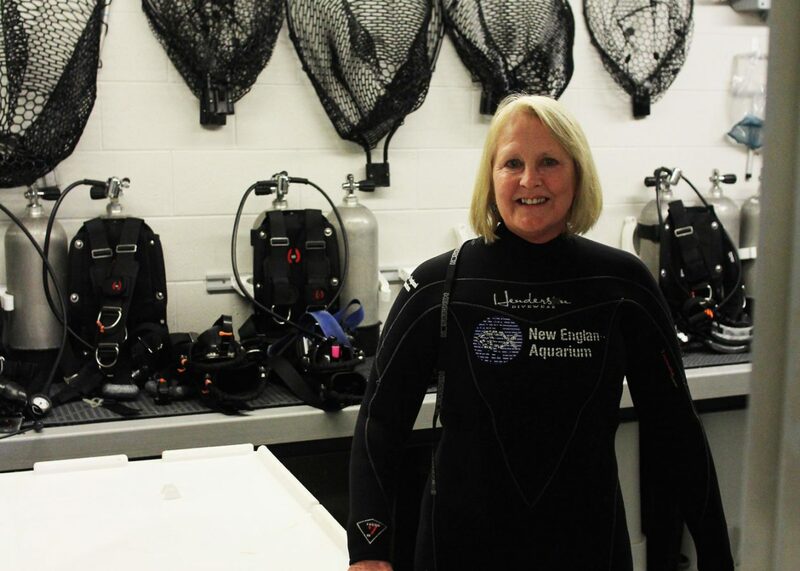 Retiring Aquarium diver Sherrie Floyd prepares in the Aquarium's splash room before her last dive. Like all diver’s talks at the GOT, Sherrie spoke into the microphone embedded in her mask from deep below the warm waters of the Caribbean coral reef environment, home to Myrtle the green sea turtle—for whom the diminutive diver has a special affinity—and more than 1,200 other animals. She answered questions posed by the audience. However, many of the questions came from her co-workers, and the queries held special significance and a bit of whimsy. She was asked about special moments during trips to the Bahamas, where she had led dive trips. She was asked about the GOT’s marine animals, her future plans, and famous people with whom she has dived, including Steven Tyler and Joe Perry of the rock band Aerosmith. At times, emotion crept into her voice, which was broadcast over the Aquarium’s sound system. And then it was over. With water dripping off her wetsuit, she shook the water out of her blond hair, posed for a few pictures, talked with some of the people who had attended her final official dive, and then made the soggy walk back to the behind-the-scenes changing room to begin the next stage of her life. After lugging thousands of scuba tanks, transporting hundreds of fish, feeding several tons of seafood, and suffering many a knuckle nick from a territorial damselfish, Sherrie’s contributions to the Aquarium are too many to count. We are deeply grateful for her many years of service and the knowledge and laughter she brought to the job. And we’re pretty sure Myrtle appreciates all those back scratches, too.